Tap the Music tab to add background music for your slideshow. You can add songs from iPad music library by Songs, Artists, Albums, and more. Find it and touch it to use the song. If you’ve already created a perfect song for your slideshow, you can use it as well. 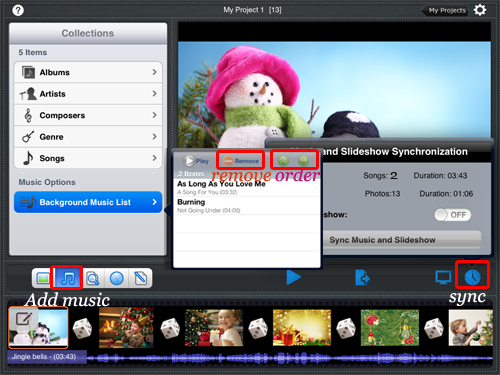 To keep slideshow and music play in pace, you can use the synchronization feature to sync slides time with music time. After adding music, "Background Music List" will appear under "Music options". Tap it to organize all songs you have added . Use the "Play" "Remove" and "Up and Down" icon to delete music and arrange song order.